Kick the midday meal up a notch with our Melting Mexican Muffins recipe. These toasted English muffins topped with lettuce, salsa and melted cheese take the lunchtime sandwich to a whole new level. 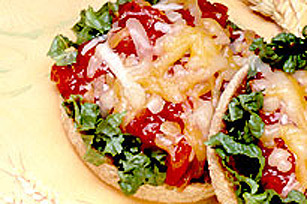 PLACE 1/4 cup (50 mL) lettuce and 2 Tbsp (30 mL) salsa on each half. SPRINKLE cheeses evenly over muffins.